Why do campgrounds charge for visitors? When guests arrive at the campground, they are often charged a visitor’s fee, which is why it’s important to know the campground’s visitor policy. The campground’s facilities can only handle so many people at a time. As additional people place an extra burden on the facilities. There are the obvious additional expenses of toilet tissue, paper towels, cleaning supplies, attendant’s labor, garbage bags, etc. The less obvious long-term expense is that expanding facilities is a huge investment these days and in order to maintain the facilities a campground has, they have to stay within the capacity boundaries for which their water and sewage systems were designed. The campground owner assumes that your family will participate in activities and events, enjoy the entertainment provided, and or utilize the swimming pool, and other facilities and amenities. Parking extra vehicles is another issue. In most campgrounds, real estate is a premium. So, too many cars per campsite quickly become a congestion and safety issue. Most campgrounds limit the number of vehicles per campsite to one or two for safety reasons and rescue vehicle access. More visitors also increase a campground’s liability insurance costs. The rates for a campground’s liability insurance are based on the risk assessment and the number of people who occupy a campground during a season. Remember that privately owned and operated campgrounds aren’t subsidized by tax dollars like federal, provincial, and municipal parks. Many campgrounds offer a full refund if you’re only there a short time (less than an hour). Who sets the rules for private campgrounds? As member campgrounds are privately owned businesses, they set their park rules and regulations, determine their rates and payment policies and use their own customized forms at their campgrounds. Like any business owner, they are required to abide by all municipal, provincial and federal laws. Why am I not allowed to bring my own firewood? 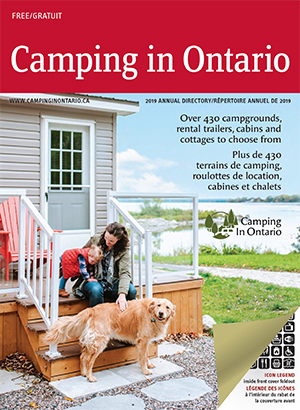 Ontario campgrounds are trying to protect their trees. While many are in, or close to Emerald Ash Borer zones, many are not. To avoid being turned away from the campground, assume that you are not allowed to bring in firewood. Most campgrounds sell wood on site. How many people does my site fee cover? Each campground sets their own rates for their campsite. Please check the campground website or ask when making the reservation as to the total cost of the camping fee. Why do I have to reserve 3 nights for a long weekend? As you know, campsites are in high demand for all long weekends. It is the industry practice to ask for 3-day reservations. This ensures that staff time is spent tending to the guests needs rather than checking campers in and out of campgrounds. Why am I charged a reservation fee? Some campground charge reservation fees for on-line or phone bookings. The cost of the reservation fee varies from campground to campground. Why do fire bans affect private and not provincial campgrounds? Under Provincial Law, Provincial Parks and Conservation Authorities do not have to adhere to municipal fire bans. If the Province issues a fire ban, then all campfires are prohibited. The License of Occupation is a contract between the campground owner and the camper(s) for use of a seasonal campsite. This contract outlines the terms of the contract, names the occupant and additional persons that will be using the site. In addition, it verifies the camper’s information including a permanent address and insurance policy. The charges for the seasonal occupation of the campsite are outlined, as well as any other additional charges (winter storage, boat docking, hydro etc.). As privately owned businesses, each campground sets their rules and regulations. A copy of the campground’s rules and regulations are attached to the License of Occupation. Why can’t I have my mail sent to my seasonal campsite? Campgrounds are designed for seasonal or temporary use only and as such, the campsite cannot be used as a permanent residence or home address. I am looking to sell my trailer at a campground. Why do I have to pay a fee to the owner? It is common for a campground to charge an administration/marketing fee when selling a trailer on behalf of a camper at a campground. Campgrounds will likely have a set of conditions under which they will sell the trailer at the campground. If you do not wish to pay the administrative fee, you may remove the trailer from the campground to sell independently. Why does the campground limit the number of people on a site? The campground’s infrastructure was designed for a maximum number of people based on the number of sites. The facilities and amenities were also designed using these same numbers. Keeping the number of guests within these numbers also ensures that all guests will have an enjoyable stay. It is for this same reason most campgrounds limit the number of vehicles per campsite. Why do my fees go up every year, but I do not see any change in the campground? Sometimes the upgrades completed or planned are not seen such as septic, water treatment and electrical upgrades. The cost to run and maintain a campground is steep. Many times the facilities that campground owners upgrade are the washrooms and pool to keep guests happy, but they also need to ensure that they are in compliance with codes and legislations, which can be costly. Why can’t I have a golf cart at my campground? Some campgrounds do not allow golf carts due to liability issues. The rate for a campground’s liability insurance is based on risk assessment. To ensure the safety of all campers, campgrounds may have regulations prohibiting various types of motorized vehicles including golf carts. Check with the campground you are planning to visit to ensure that they allow golf carts.